In this digital age, it seems that many facets of traditional advertising are being overtaken by digital advertising. One of the largest changes we have noticed in recent years is the shift towards Influencer Marketing. While some are still skeptical of this newly emerging form of advertising, it has shown exponential growth and has a high success rate when it comes to helping businesses grow. Influencer Marketing is not going anywhere, in fact, it is an industry that is growing at an impressive rate, and if you want to get in on this powerful form of digital advertising there are a few things that you need to be aware of. We should probably start with the basics. Many people still are unaware of Influencer Marketing, and want to know exactly what it is. Simply put, Influencers are individuals with a large following online. This can be on any number of platforms from blogs, to social media, or YouTube. Due to their large followings, these individuals have influence. The people who follow them typically trust their opinions and are likely to take their recommendation on a product or service. In the world of Influencer Marketing, a business will typically pay an Influencer to promote their product. Payment rates can vary from the thousands to a simple exchange of product. The Influencer will promote the product either on their Social Media, in a Video, or on their Blog depending on your agreed upon arrangement. The benefits of utilizing Influencer Marketing to grow your business are plentiful. For one, Influencer Marketing tends to be significantly less expensive than traditional marketing methods. Think about this: Television Ads, Radio Ads, Print Ads…. these all come with a hefty price tag, and the idea of recruiting a celebrity to endorse your product is pretty much out of the question for a small business. By using Influencer Marketing you are having a “celebrity” of sorts endorse your product, and it is much more cost effective than traditional forms of advertising. People online also tend to have a higher level of trust when it comes to their favorite YouTube star or Blogger than they do for traditional celebrities. Influencers are much more connected with their audience, and this lends itself well to marketing and advertising. Their followers trust them, think of them more as a friend than as a celebrity. Because of this trust, having an Influencer recommend your product can lead to an increase in sales and visibility. 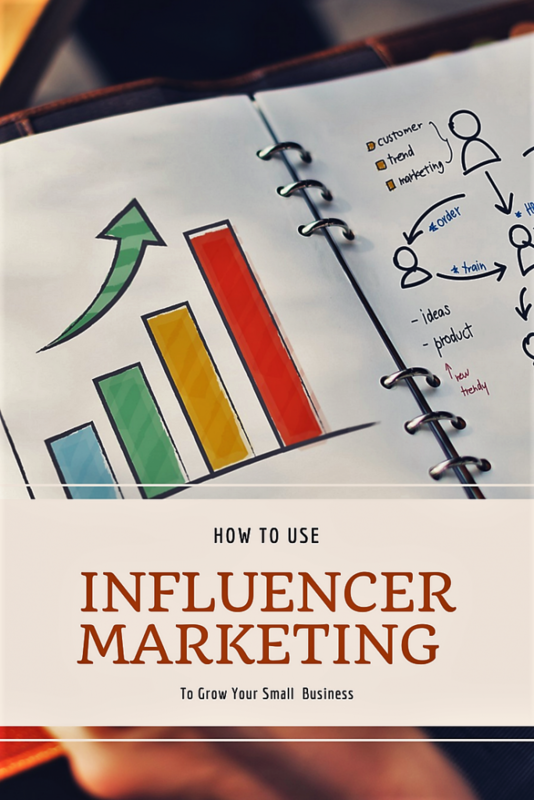 Now that you are aware of what Influencer Marketing is as well as its many benefits, you probably want to jump in feet first and start slinging your products at every blogger in town, but let’s hold on a minute and discuss a few things. First, you want to make sure that any Influencer you work with is a good fit for your brand. For example, if your target audience is moms with young children, you will want a “mom blogger” or ” mom Influencer” who has young children herself. Both of your audiences must align for this to truly work. You wouldn’t want someone with a large audience that consists of mainly men to market your baby products. Also be sure to dig a little deeper before making a commitment to have someone speak for your brand. Take a look at their blog, videos, and/or social feeds and make sure their voice aligns with your company’s. For instance, if your particular brand is elegant and refined you may not want to engage an influencer whose voice is typically blunt or bawdy. Do you have a discount brand? Then someone who usually reviews high-end products that are out of the price range of your customers may not be a good fit. It is also important to know the different types of Influencers. There are Celebrity Influencers who typically have massive numbers, in the millions, of followers. These guys may be out of your budget! Next up we have large Influencers. They usually have audiences of over 100K . Finally there are mico-influencers. A typical micro-influencer will have between 10-100K followers. You may be thinking, “The bigger the better.” But with Influencer Marketing, that isn’t always the case. It is not only numbers that you need to take into account, but engagement as well. Engagement levels can actually be even more important than follower numbers. Engagement is any likes/comments/shares on the posts that the influencer puts out. If their audience is engaging by commenting, and the Influencer is engaging back and responding to comments and building a relationship with the audience, then the members of the audience are more likely to have a higher level of trust for the Influencer, making them in turn, more likely to make a purchase based off of a recommendation. Do you know which Influencer type typically has the highest level of engagement? The Micro-Influencer! Yup, many times, micro-influencers are going to be your best bet when diving into the world of Influencer Marketing. So where do you find these Influencers anyways? That is actually the easy party! Search your favorite social media platform first. Start with Instagram for example. Type in a relevant and popular hashtag in your niche and check out the profiles of other people who have used that hashtag. Typically, Influencers will have something to indicate they work with companies in their profile, like “PR Friendly,” “Email for Collabs,” etc. From here, you can see if they have other creative outlets, like maybe they are big on Instagram but also have a blog or YouTube channel. Send them an email and strike up a conversation, it doesn’t need to be extremely formal but it does need to get to the point and let them know that you are interested in working with them. If you still aren’t sure about this whole Influencer Marketing thing, keep in mind that Influencer Marketing has grown into over a billion dollar business and is projected to double by 2019! Influencer Marketing is one of the most beneficial advertising methods out there at the moment for small and eCommerce businesses. From it’s inexpensive cost, to the more personal nature of the advertising, everything about this new form of advertising has benefits for you as a business owner. Keep in mind though, not all Influencers are alike, and you need to do your research and take your time when it comes down to choosing who to work with. Don’t forget to come back every Monday for even more Small Business and eCommerce tips to help you grow your business! If you are looking to grow you eCommerce business, come check out all of the ways that ProductCart can help you. From hosting, to developing and building your store and even building relationships, ProductCart has the features to help you take your eCommerce business to the next level.